Poisonous Pipeline is the thirty-fifth level in Donkey Kong Country 3: Dixie Kong's Double Trouble! It is also the fifth area of KAOS Kore. In the game's Game Boy Advance remake, it is the forty-first level instead. This level takes place in a mostly-flooded pipeline. The pipeline is filled with a poisonous, purple liquid that reverses the player's left and right movements. However, up and down movements are unaltered. Enemies here include the underwater foes, Lurchins and Kocos, as well as a single Krimp found in a dry area of the stage. Enguarde the Swordfish can be found in a Bonus Stage and can help the Kongs for a portion of the level. At the beginning of the level, the Kongs swim through a long pipeline, passing many Lurchins and Kocos. At the end of the long pathway, the Kongs head through a smaller area downwards and swim left. They will meet more enemies here, especially the shell-covered Lurchins. Soon, they take a small pathway down to a lower part of the level. There, they will travel east and head down the first opening they see. Continuing downwards, they find the letter O and move to the right to find an upward pathway. Swimming around a few Lurchins, they make it to a slightly higher area, where they pass a large group of Lurchins and move downwards. They head through a thin pipe, where they find the Star Barrel. About halfway through the level, the Kongs enter another long area, where they swim down a large pipeline and avoid countless schools of enemies. Soon, they find two Lurchins moving through a small pathway. Going under the enemies, they make their way into another area. There, they pass several Kocos and also find the letter K in an above alcove. Farther on, the Kongs pass many more Lurchins, assisted by the small Kocos. Once they begin to take an upward pathway at the end of the area, they will dodge some Kocos and travel west. Shortly after going this direction, they will come up to another pathway, which they should head up. They move around a few Lurchins as they make their way into the next part of the level, where they travel east past more enemies. Heading up again, they sneak between two Lurchins to see yet another upwards pathway. If they continue up from this area, they will eventually reach the surface of the poisonous water. On the nearby platform, they will also see a flagpole. If they pull on the end of the flagpole, the level will end. About a fourth of the way through the level, there is a Koco swimming between two Lurchins. The Bonus Barrel is between the Lurchins. The barrel takes them to a Bonus Level, where they will need to swim through another poisoned area with Enguarde. With Enguarde, the player will have to defeat several enemies. Once all these enemies are beat, they will earn a Bonus Coin. 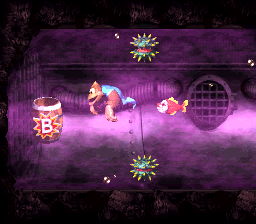 Near the end of the level, the Kongs can swim between two Lurchins around two Kocos. If they continue to the left from here, passing several Lurchins, they will find a passageway going downwards. Following this pathway, they will soon come up to a Bonus Barrel that will take them to a Bonus Level. There, they will have to swim in a large circle through the pipeline, collecting stars. If they collect all the stars withing the time limit, they will find a Bonus Coin back at the start. After the heroes find the letter G, the Kongs should jump to the surface of the liquid and land on a platform with a Koin, who will have the DK Coin. They will have to defeat him to get it. The enemy's shield will protect him from most attacks, so the heroes will have no choice but to use the nearby steel barrel. With the barrel, they should stand on the foe's shield and throw it against the wall to the right. The barrel will bounce off of the wall and hit the side of the Koin, defeating him. With the Koin knocked out, the DK Coin will be given to the Kongs. In Donkey Kong Country 2, Kaptain K. Rool shoots purple clouds that also reversed the Control Pad input. Unlike this level's poisoned water, the up and down controls were also reversed in that game. This page was last edited on April 10, 2019, at 13:53.